Infant milk formula is used for feeding infants under 12 months. Infant milk contains necessary nutrients, such as casein and lactose, which are necessary for the superior growth of the infant. 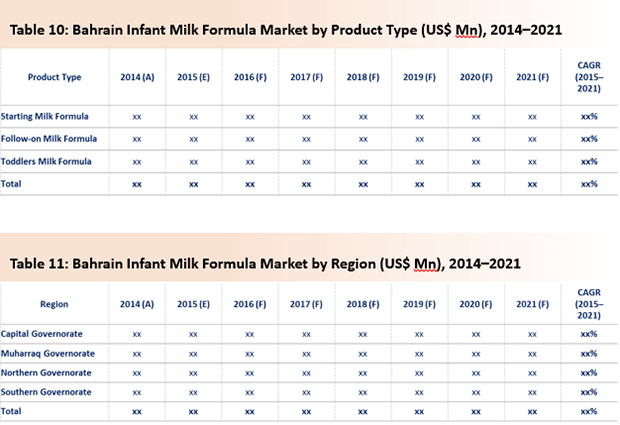 The MENA infant milk formula market is anticipated to exhibit remarkable growth over the forecast period, owing to the growing nutritional concerns in case of infants. The rise in the number of working women is the major factor driving the growth of the MENA infant milk formula market currently. Factor such as the rapid economic development and increasing disposable income of the consumers in the MENA region are also propelling the growth of the infant milk formula market in the region. To understand and assess the opportunities in this market, the report is categorically split into three sections, namely market analysis, by product, distribution channel, and region. The report analyzes the MENA infant milk formula market in terms of market value (US$ Mn). In the same section, PMR covers the MENA infant milk formula market performance in terms of revenue and consumption. This section includes PMR’s analysis of the key trends, drivers, and restraints from the supply and demand perspective. Impact analysis of the key growth drivers and restraints, based on the weighted average model, is included in this report to better equip clients with crystal clear decision-making insights. The next section of the report analyzes the market on the basis of application type and presents the market size in terms of value over the forecast period (2015–2021). The next section of the report analyzes the market on the basis of product type and presents the market size in terms of value over the forecast period. Of these, the starting milk formula segment accounted for 51% revenue share of the overall infant milk formula market in 2015, followed by the follow-on milk formula segment. The starting milk formula segment is mainly driven by the increasing number of middle-income consumers in the MENA region. However, the major factor that restraints the market growth is the rising prices of the starting milk formula. The section that follows analyzes the market on the basis of the distribution channel and presents the market size in terms of value for the forecast period. Of the mentioned segments, the online retail segment is expected to expand at the highest CAGR of 16.2% in terms of value during the forecast period. However, the chemist/pharmacies/drugstore segment is expected to dominate the infant milk formula market in terms of revenue share contribution, accounting for 73.4% share of the overall market by 2021. The section that follows analyzes the market on the basis of region and presents the market size in terms of value over the forecast period. Infant milk formula is a type of food used for feeding babies below the age of 1 year. Infant milk formula food is used solely for infants. The infant milk formula simulates human milk and, thus, is used as a substitute for human milk. Starting milk formula, follow-on milk formula, and toddlers milk formula are among the various types of infant milk formula in the market. Infant milk formula includes all essential nutrients and energy required by infants to grow and develop normally. The most commonly used infant milk formula contains proteins such as whey and casein, vegetable oils, lactose, and other ingredients.